The medieval Japanese custom of ohaguro, or blackening of teeth, was considered a mark of beauty. Unfortunately for you, this isn't medieval Japan, and whiter teeth aren't just desirable for their beauty -- they're a sign of good dental health. While it's not entirely possible to undo the damage of certain issues relating to your yellowing grill, it is possible to run damage control and improve the gleam radiating off of the chompers you've got. 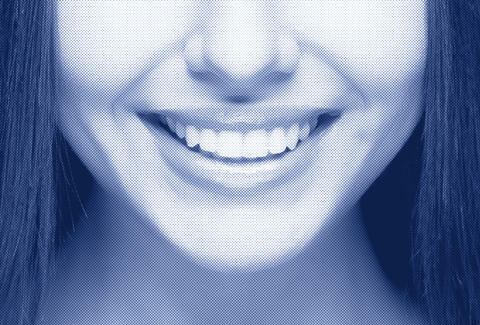 Here are some of the best ways to whiten your teeth without shelling out loads of cash for a full-on professional bleaching. Let's assume you brush twice a day, and hey, you even remember to floss. The reason your teeth are still susceptible to stains is mainly because of the darker foods you're eating, like berries and heavy sauces, and your consumption of drinks like coffee, red wine, and soda. All of these things can adversely affect the enamel and leave their permanent mark, but dark colas are the worst offenders because they can actually cause some enamel to deteriorate. Makes sense, right? You may have even seen those time-lapse videos of teeth in soda, and they aren't pretty. Also, some of us are just born this way, with slightly yellower teeth than others. Tough break. "Enamel" is basically the outer coating of your teeth. It's semi-translucent and delicate, even though it serves as the tough exterior to the tooth itself. "Enamel is porous and picks up stains from things like coffee and wine," says Victoria Veytsman, DDS. "It does not grow back, so you want to do your best to protect it." We're not going to tell you to majorly change your consumptions habits: Instead, we're going to help you protect your teeth while still consuming whatever you'd like. The first key: Rinse your mouth out after you eat/drink anything dark. And, if you must imbibe, try to drink dark liquids through a straw, says Dr. Jeffrey Rappaport. "If you're going to do this, remember baking soda is very abrasive and brushing too hard can cause damage to enamel," Dr. Rappaport suggests. "This is great to do at night to break up any stains that may have accumulated during the day from drinking coffee or red wine and eating foods like berries. But it shouldn't be used immediately after meals." Kami Hoss, DDS, MS, of Howard Healthcare Academy, suggests using hydrogen peroxide instead of water. "Hydrogen peroxide is known for being an antibacterial agent, so it's great for cleaning germs, but it's best to limit the use of this method to three times a week," he adds. "It's very important that individuals continue to rinse their mouth thoroughly afterward to reassure that no hydrogen peroxide or baking soda is left behind." Basically, this means swishing a tablespoon or so of an oil like coconut or sesame around in your mouth for a while. "Oil pulling, or swishing, with coconut oil is thought to have whitening properties," says Dr. Rappaport. "If you're going to do that though, be ready for the long haul, it isn't a one-and-done deal. It's practiced daily for 20 minutes." Dr. April Patterson says that even swishing it around for one minute in the morning every day can do some good. "You can go about your day because you've created a slippery protective shield over your teeth that food and drink particles that cause staining won't be able to attach," she says. Rumor has it that rubbing lemon rinds and even crushed strawberries against your teeth will whiten them. "These foods contain a lot of citric acid which can cause tooth damage instead of making them sparkle," said Dr. Rappaport. Pretty much every other dentist we spoke with said the same: Avoid the citrus, in paste form, juice form, or rind form… the high acidity level actually wears enamel away. Activated charcoal is the newest kid on the block when it comes to whitening. Dr. Hoss says that because of its absorption properties, activated charcoal can help change the PH of the mouth, and can kill bad bacteria present in gingivitis. "It can reportedly whiten your teeth after a few uses," he says. "Those with sensitive teeth are typically concerned that the charcoal may be too harsh, so try dabbing the charcoal onto the teeth without scrubbing." However, not enough has been done to scientifically study its efficacy, and if you do want to experiment, Veytsman advises to use it sparingly. "Once in a while is fine, but definitely not every day," she says. "I worry about the abrasive quality of charcoal." Helaina Hovitz is an editor, journalist, author, and media startup co-founder living in New York City.